At the sale in October 1926 the Alexanders paid £41,400 for the entire Tocal estate in a single bid. Charles set out to impose a new structure and ethos on Tocal. During the Reynolds period there were up to 25 people working on Tocal, but the Alexanders sacked everyone except Earl (Daly) Kidd. In time, others joined the staff, but it was always a lean operation. 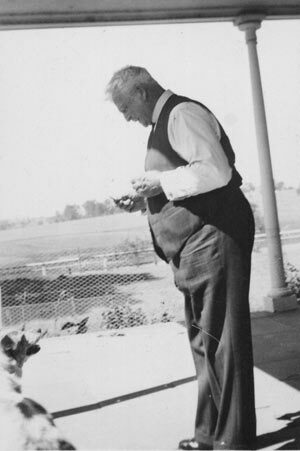 Right: Charles Alexander on the front verandah of Tocal Homestead. Charles bought many of the Reynolds's stud animals at the Tocal dispersal sale, and showed them for some years but this was not his abiding passion and it soon gave way to more money-making enterprises. Charles took particular interest in anything mechanical. His pet projects were modifying the stone barn to take his cars and setting out tank stands and an intricate water reticulation system for the Tocal homestead area. The visit to Maitland by the Duke of Gloucester in 1934 was a grand occasion. Charles had the best car in the district, so was chosen to chauffeur the Duke around. It was a rare, very public, appearance. The fact that a photograph of Charles with the Duke was framed and mounted indicates that Charles was delighted with the honour. What did it matter that his car was the chief attraction? Housekeeper Beatrice Bailey started work at Tocal in 1936 at the age of 18. She remembers how frugally the Alexanders lived (there was only Charles and Jean by this time). Nothing was replaced in the house. It was mended or made to do. Towels and blankets were threadbare. They wasted nothing. Their lifestyle reflected their roots in the poverty of the Glasgow slums. 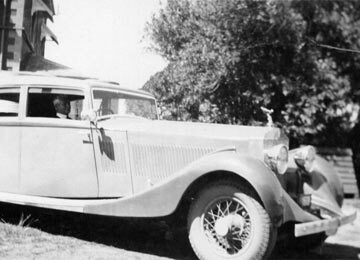 Above right: Charles in his Rolls Royce at Tocal Homestead. Despite their lifestyle, the Alexanders supported a variety of charities. They had accumulated much wealth and, in their remaining years, gave lavishly to causes that excited their interests and matched their ideals-mainly religious institutions and hospitals. Towards the end of the 1930s Charles constantly worked on his Will, guided by his sister Jean. 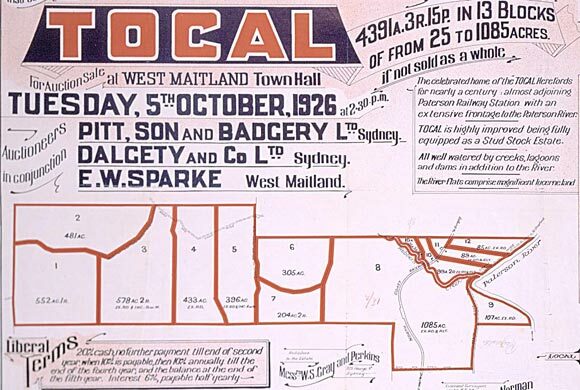 Above: Part of the poster advertising the sale of Tocal in 1926. Despite being offered in several lots, the whole of Tocal was snapped up in one bid by the Alexanders.